While the app will enable users to get “personalized” news, it will also include top stories for all readers, aiming to break the so-called filter bubble of information designed to reinforce people’s biases. “Having a productive conversation or debate requires everyone to have access to the same information,” Upstill said. He said the “full coverage” feed would be the same for everyone — “an unpersonalized view of events from a range of trusted news sources.” Some journalism industry veterans were skeptical about the effort to replace human editors with machine curators. “There’s been a fantasy of (algorithmic) personalized news for a log time,” said New York University journalism professor Meredith Broussard. 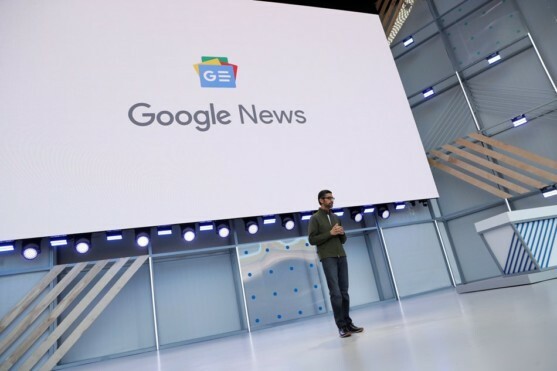 In the new app, Google’s “newsstand” addresses some concerns by allowing users to sign up for subscriptions using their Google accounts, and will enable publishers to connect with readers directly. Dan Kennedy, a Northeastern University journalism professor, said the revamped news app appears to be positive for the news ecosystem. “For many years, Google refused to share ad revenues with news organizations on the grounds that Google was driving traffic to them, and that it was up to those organizations to figure out how to monetize that traffic,” Kennedy said. “Now, with more than 90 percent of all new digital ad revenues going to Google and Facebook, Google is finally acknowledging that it’s time to try something else.” Nicholas Diakopoulos, a Northwestern University professor specializing in computational and data journalism, said the impact of Google’s changes remain to be seen. Diakopoulos said algorithmic and personalized news can be positive for “engagement” but may only benefit a handful of news organizations. Diakopoulos said that while AI can offer some advantages in news curation, “you still need people involved in many different ways. you need to reflect human values, editorial values… you can’t quantify every aspect that might be important to an editorial decision.” The growing importance of the platforms raise the questions of whether Google and Facebook are “media” companies and not simply technology firms, a moniker both have resisted. Diakopoulos said Google “is becoming more and more like a media company,” although that is sometimes difficult to define. “Yahoo started as a tech company and became a media company, and maybe Google is headed in that direction,” he said.